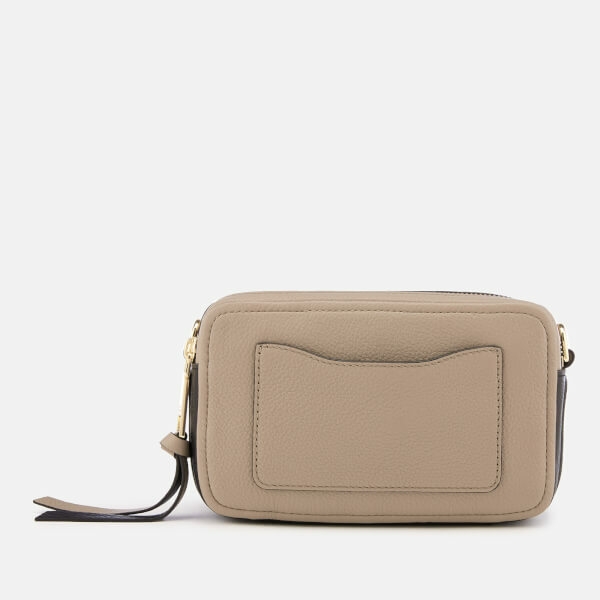 Marc Jacobs 'Softshot' cross body bag from the Double J Collection. Crafted from supple grain leather in beige and black, the camera bag comprises a dual-compartment structure secured by a pair of zip fastenings with elongated pull ties. The interior of the bag is fully lined and includes three card slots on one side. A detachable leather strap with gold-tone D-ring hardware and adjustable capstan studs enable the bag to be styled as crossbody bag or clutch. The iconic ‘Double J’ logo in gold-tone metal decorates the front and gold foil branding at the top completes the style. Presented in a branded dust bag. Dimensions: H: 13cm x W: 21cm x D: 9cm. Strap Drop: 58cm.